Yellow Lab names can be fitting for the color and temperament of your yellow Labrador Retriever, or simply a dog name that pleases you. If you don’t yet own a Lab, you are in for a treat. They are intelligent, loyal, quite easy to train and full of love. Although I can’t speak for a yellow Lab, I do have some experience with this breed. Our family enjoys the companionship of Bailey, a wonderful chocolate Labrador Retriever. Right next door at my sister’s house (yes, we like living next to each other), there are two Black Labs named Mollie and Buck. These are all fine yellow Lab names, but there are many more choices. If you will use your yellow Labrador Retriever as a hunter, you might consider one syllable dog names. When issuing voice commands, one syllable hunting dog names are often easier for the dog to understand. When using a one syllable name, just be certain you don’t go with a name that sounds like one of your commands. For example, Bo sounds like “no,” and Fletch sounds like “fetch.” Maybe you won’t be using those commands, but you get the idea. Regardless of your motivation for choosing this most popular dog breed, take your time and browse the yellow Lab names list below. If you are still undecided on the breed, visit our Labrador Retriever information page to learn more. Below is a list of more than 160 yellow Lab names. Have fun snooping through the list. If you don’t find a name you like, return to our Labrador Dog Names list or our Dog Names by Breed page to see more categories, or expand your search to our list of more than 4,000 puppy names. Are you like me and you want or own a Chocolate Lab? Explore our Chocolate Lab names list. Can’t find the name you like on the Yellow Lab Names list? Don’t give up. 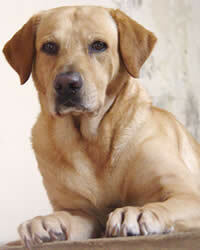 Return to our Labrador Dog Names list or the Dog Names by Breed page to do some more exploring. If you have a great name, tell us about it! Why do you like the name? Is this your own dog's name? You get the idea.